While being “Big in Japan” is typically a phenomena experienced by, outside-the-mainstream, one-hit-wonders here in the United States, for Kaoru Ishibashi (the bilingual genius behind Kishi Bashi) it seems only natural he’d galvanize a fanbase spanning the sparkly Pacific Ocean as he actively cultivates each one, occasionally singing (and tweeting) in Japanese. It seems that Kishi is executing a beautifully crafted inter-continental career strategy, the trajectory of which is marking spectacular growth. Yet, one cannot help but be thrown-off by his cleverly humble freshman appellation, certainly much has been made of the title of K’s first full-length album, 151a: the Japanese cognate (not-really) which translates roughly to “once in a lifetime“. Based upon his work to date I expect the make-or-break, once-in-a-lifetime, concept album will lead to second, third, fourth, and so on releases, success will surely reward talent on this occasion. Philosophize! Chemicalize! 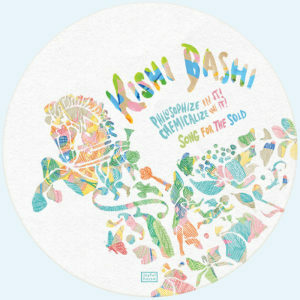 is a compilation of Kishi Bashi’s 7″ Box Set and three new tracks: The expanded Philosiphize in it! Chemicalize with it! (spelling taken from the disc), Song for the Sold, and Unicorns Die When You Leave. The latter two sounding closer to Ishibashi’s early work with Jupiter One. If you don’t already own the 7″ Box Set, available separately from Joyful Noise & Bandcamp, Philosophize! Chemicalize! is a must-have, of course at this juncture you may have to travel 5,000 miles to get it. Kishi Bashi’s music makes me feel hope and joy and I can’t thank him or you enough for sharing.